Can you see the cell tower in this photo? Hint: It's on the facade. NEW YORK (CNNMoney) -- The cell phone capacity problem is getting bigger by the day, but one potential solution has wireless carriers thinking smaller -- way smaller. As smartphone and tablet usage soars, the giant cell towers that mobile devices communicate with are getting overloaded. As a result, cell phone companies have begun to get behind the idea of "small cells": tiny antennas that you can hold in your hand. Small cells make much more efficient use than traditional towers of carriers' increasingly precious wireless spectrum. The low-powered devices can cut back on interference, improve cell reception indoors and become Wi-Fi hotspots to offload traffic from cramped cellular networks. Such spectrum-maximizing tricks are becoming increasingly important as mobile traffic booms. By 2016, more than half of the Internet's traffic will come from mobile devices, and 71% of that will be big video files, according to Cisco's (CSCO, Fortune 500) latest Mobile Visual Networking Index, the industry's most comprehensive annual study. Carriers would typically handle that growth by adding new cell towers or more radios to existing towers. But that's an expensive process, and many metropolitan areas are now so packed with towers that new ones would be riddled with interference concerns. "That has major implications for how you build out mobile infrastructure," said Murali Nemani, head of service provider marketing for Cisco. "The rationale behind small cells has a lot to do with this perfect storm that is brewing." Echoing Apple's proclamation of a "post-PC" world, Cisco CEO John Chambers said last month that we are entering a "post-macrocell era." Telecom analysts agree. Small cells will make up 90% of total cell tower deployments by 2015, Nomura analyst Stuart Jeffrey predicts. One of the main selling points is their low cost. The revenue generated by small cell infrastructure sales will make up just 5% of the total revenue from base station sales, Jeffrey estimates, even as small cells grow to dominate the market. They also offer greater flexibility. Wi-Fi is a potent tool for fighting the spectrum crunch -- carriers can use it to offload traffic from their cell networks -- but today's networks can be painfully tricky to use. Customers have to seek out a network, remember their credentials, and manually sign in. Cisco's small cells use a new "passpoint" standard, certified by the industry-governing Wi-Fi Alliance, that allows carriers to automatically sign their customers in to hotspots. The technology is expected to be released this summer. One day soon, you could walk into a mall with your iPhone and be switched to your carrier's Wi-Fi network without even knowing it. The carriers aren't touting the technology just yet -- Verizon (VZ, Fortune 500), Sprint (S, Fortune 500) and AT&T (T, Fortune 500) all declined to comment for this article about their small-cell investments -- but they're all in various stages of deploying it. AT&T recently won approval from Palo Alto, Calif., city officials for a significant test project throughout the city. Verizon's top network planning executive said at a conference last year that the carrier will use small cells to help manage its network capacity, while Sprint recently partnered with small cell hardware maker AirWalk Communications. Cisco is just one of many mobile infrastructure providers hoping to get on the bandwagon. 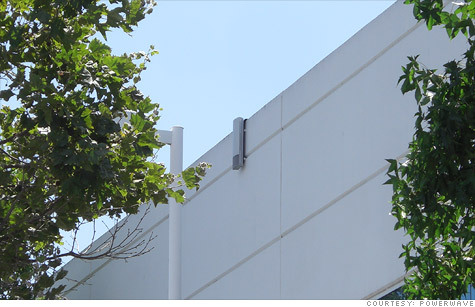 Alcatel-Lucent (ALU), Powerwave (PWAV) and others are promoting their own small cells, each with a different feature set. Alcatel-Lucent's lightRadio, introduced last year, is a cube that fits in the palm of your hand and can be fastened to the top of lamp posts or placed on the sides of buildings. The company is developing several new devices, based on lightRadio, that will bring coverage indoors and be capable of sending both 3G and 4G signal simultaneously. Powerwave's small cells are able to plug into an ethernet connection and broadcast a carrier's signal. They are also designed to blend in to their surroundings so they don't become an eyesore in places like office buildings or stadiums. "There is a huge opportunity coming," said Juan Santiago, head of Powerwave's product management. "No one wants a giant cell tower in their backyard."